To dual boot means that you have more than one operating system installed on the harddrive and that you can decide between the two when you start your computer. Ubuntu Linux runs on your computer like any other operating system, playing middle-man between the physical computer and the software you like to use. 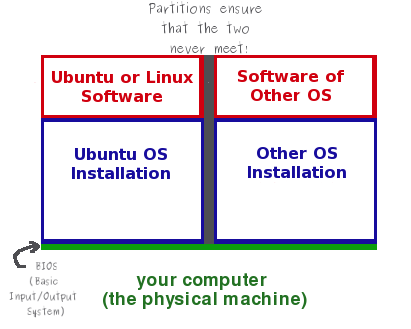 Since the operating system actually controls the hardware, two operating systems cannot control the same computer at the same time. You must therefore choose your operating system when you start your computer. While the hardware remains the same, the running operating system and software are separate from each other. Therefore, you cannot share applications (at least not without an emulator). If you are limited to one computer for any reason, dual booting is an effective way to have two computers for the price of one. It affords you the capabilities of both operating systems without the purchase of another computer. Can Ubuntu Read Windows Files? Yes! Ubuntu reads Windows directories perfectly well. Windows XP is able to run under two different file system types: FAT32 and NTFS. Ubuntu can read both of them. Writing is a different matter. Ubuntu can write to both, but writing to FAT32 is older technology and therefore more stable. The ability to write to NTFS is relatively new for Ubuntu and Linux in general. Therefore, there may be a few glitches that have not yet been found. If you want to be sure that Ubuntu can read and write to your Windows harddisk, it is best to install Windows with a FAT32 filesystem. Can Windows Read Ubuntu Files? No. Microsoft usually tries to pretend that Linux does not exist. Therefore, Windows does not recognise that Ubuntu is even installed. If you need this functionality, you might contact Microsoft and ask for it. If you want to share the files between the two, however, you can use Ubuntu to write the files to the Windows partition. Windows will then recognise the files when it next starts up.